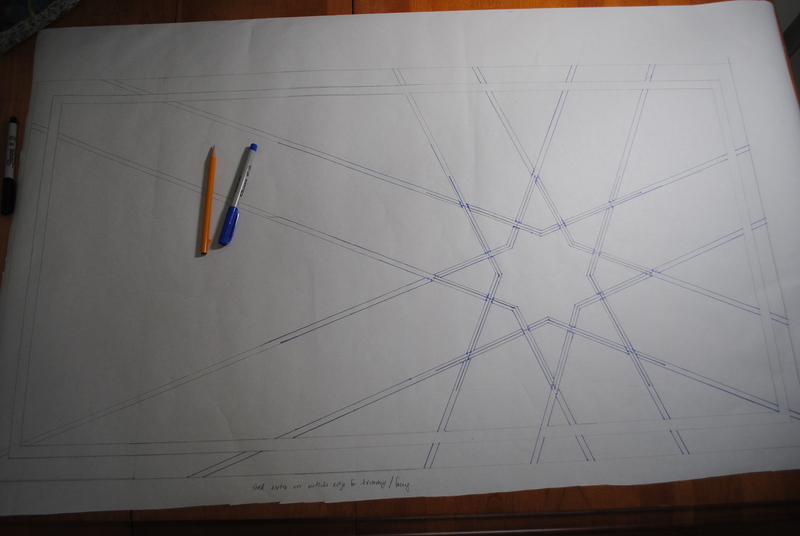 I have gotten started on my next arabesque quilt. This design is based on a geometric tile pattern from The Great Mosque of Cordoba in Spain, built over the course of 200 years and completed in 987. (Broug, Eric. “Islamic Geometric Patterns,” 27.) I’ve taken just one tile and set it off-center and carried the lines out to the edges to create a rectangular piece. Why the heck didn’t I use the Ultimate Stencil that I ordered from Cindy Needham specifically for this purpose??? How in the world am I going to sew this with the intertwined lines? I guess if I didn’t want a sewing challenge, I wouldn’t have started on this path! I’ll keep you posted on how it’s coming. Next up is to find the right fabrics.